The increased amount of rainfall in the Inland Empire and Southern California area may have been a nuisance for many students at California Baptist University, but there is a beautiful and sometimes overlooked phenomenon that comes with the bad weather. This is one of two “super bloom” occurrences within just a two-year time-span, although they typically occur every 10 years and even less in times of drought. In fact, the poppy fields at Lake Elsinore recently drew many more tourists than the park could accommodate to the point where it was necessary the area be closed because of the abnormally large number of visitors flocking to see them. Although it has since reopened, the overcrowding of parks because of the “super bloom” remains a concern, particularly in regard to the availability of parking and traffic issues. Another point of concern has been potential damages to the wildlife in areas surrounding trails as the volume of visitors rapidly increases. After a shut down of the poppy fields in Walker Canyon March 17, park officials have reopened the canyon to tourists but with some new conditions designed to keep the crowd levels under control. Guests are now required to pay for a shuttle system to get to the flowers in an attempt to cut down on overcrowding. Students at CBU have taken notice of this phenomenon in particular through social media and photos others have posted. Gabrielle Flores, sophomore film production major, said she has seen the flowers both along the side of the road and in her Instagram feed. Taylor Duncan, junior photography major, said she saw the “super bloom” in action and also witnessed the benefits it can present to her and her artwork. Duncan also attributes the “super bloom” to the overwhelming amount of rain that the Inland Empire area has experienced and sees the bright side of this stormy weather. “Being blessed with a lot of rain has made everything grow so beautifully,” Duncan said. 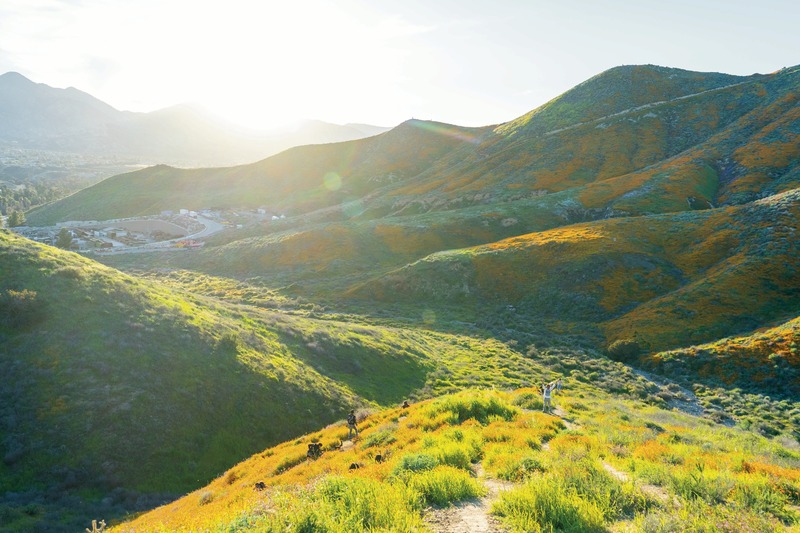 Dr. Jacob Lanphere, associate professor of environmental science, emphasized the specific conditions needed for a “super bloom” to occur and how all of these have been present in Southern California recently. Lanphere also highlighted how the butterfly migration recently occurred and passed through Riverside is directly linked to the fact that the “super bloom” provides a way to sustain the butterflies. “Migration of the painted ladies butterflies is a byproduct of the ‘super bloom.’ Scientists thought they were going to be in danger of dying off, but they recorded more than one billion migrating this year,” Lanphere said. In addition to this, Lanphere mentioned how the array of wildflower species recently appearing in the Southern California region has not only attracted tourists but also botanists who have come from across the nation to study these rare flowers. “Botanists are coming from all over the place to see the Chocolate Lily. It rarely blooms but the sustained rainfall has provided the right conditions.,” Lanphere said. For CBU students who want to observe the wildflowers in the Inland Empire area, Lanphere recommends going to Lake Elsinore or the Santa Rosa Plateau and picking up a flower identification book to get the most out of this year’s phenomenon. Shuttles costing $10 per person are available weekends going to the poppy fields at Walker Canyon with expected wait times ranging from 45 minutes to two hours.